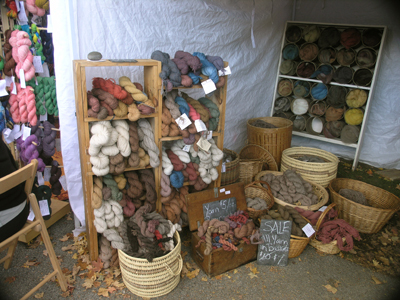 Oh, the glorious Sheep & Wool Festival in Rhinebeck, NY! I wait for it every year. This is the event where it is impossible to find a straight line anywhere. 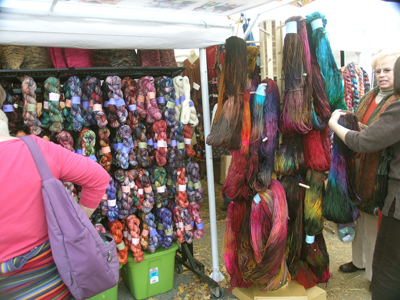 A festival that celebrates everything about fiber — animals, products, tools — all is fuzz. The fluffy sheep, goats, rabbits, llamas and alpacas, the sweaters and yarn, and mostly the people clothed in sweaters, hats and mittens. Even the day was fuzzy with early morning autumn haze. 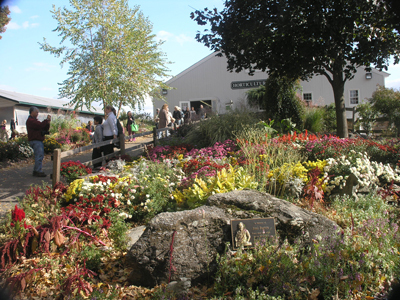 I went this year with Husband on Sunday, and we wandered for hours. 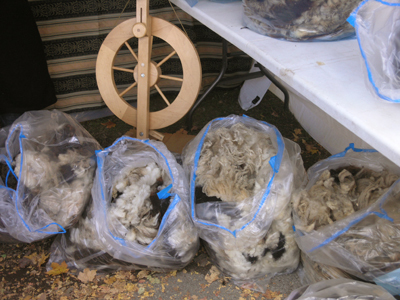 Scent of sweet hay and strong coffee in the air, the entire Dutchess County Fairgrounds was turned over to the event, with shed after shed of animals, roving, spinning wheels, and baskets of raw fleece. I didn’t want to leave. Flowers outside the Horticultural Building, everything was inviting. I learned that horns are alive, and if you run your hand along the underside, you will feel the warmth. 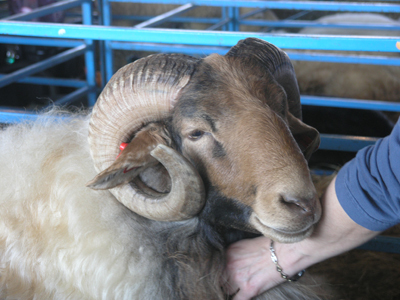 Almost as warm as this ram's eyes. 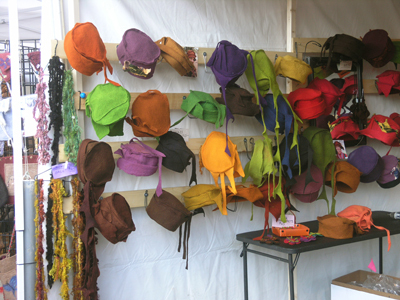 Felted wool hats, in a rainbow of colors. 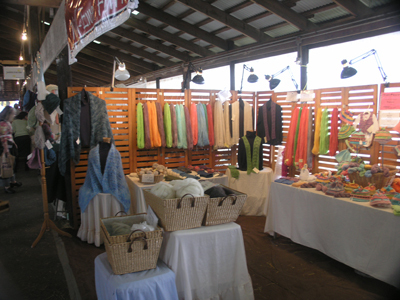 One of the shed displays, with baskets of raw fleece in the front, inviting you to plunge your hands in deep. I did! 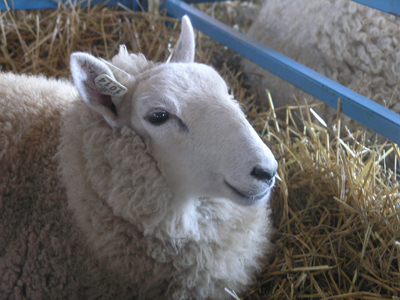 With a little face that looks like a rabbit, a smiling Cheviot. 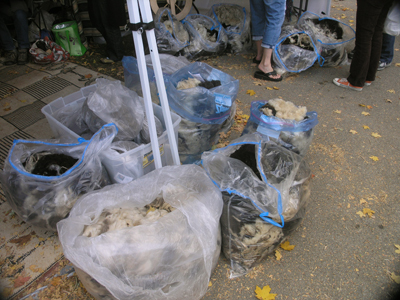 I confess that the natural colors of the raw fleece are much more appealing to me than the riot of dyed yarns. But they ARE pretty, I admit! 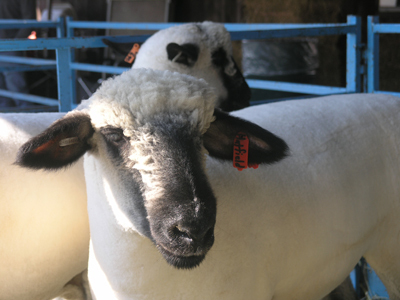 American Oxford Sheep were the featured breed this year. And it looks like she knows it. 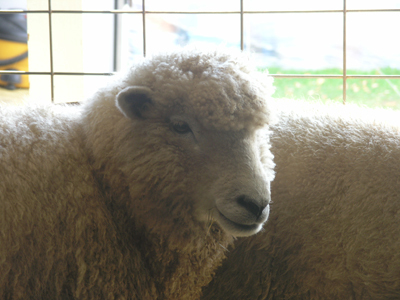 Very self-possessed, this ewe. 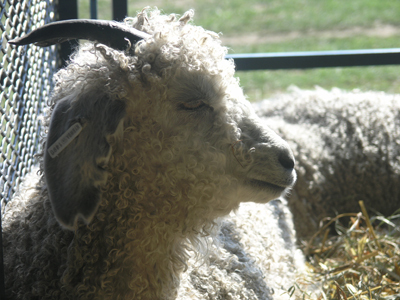 A goat with curly locks, dozing in the sunshine. 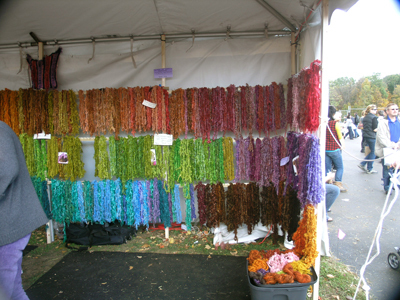 These skeins are a little more subdued in color than those in the photo that follows. All the colors of the rainbow, and a soft one, at that! My marriage, illustrated: I want the fleece, Husband covets tools. And ending with my favorite face: the noble Romney. And the translation for the title of this post? Think sheep, goat, alpaca. They all spoke to me.